An interesting story surrounds the history of this temple. According to Sri Tiruchi Mahaswami, he saw three sacred eagles or Garudas hovering over the city of Bangalore. It was January 14, 1960, Sankranthi Day. The three eagles resembled Durga, Lakshmi and Saraswathi, who also appeared to him earlier in Mount Kailas. Accompanied by two of his disciples, the spiritual guru then saw a path that led to the village where the temple is now located. He followed the eagles until he reached a piece of land with guava trees, on which the eagles seemed to be circling. That incident spoke to him and convinced him to establish a temple in the area, and so he purchased the land where the guava trees were and laid a foundation stone in the early morning of April 3, 1960. The spiritual teacher was on a pilgrimage from Kashi, Prayag and Mount Kailas prior to reaching Bangalore and seeing the Garudas. Slowly he developed the divinely ordained piece of land by putting up an Ashram complex with a temple and schools that offered free education. 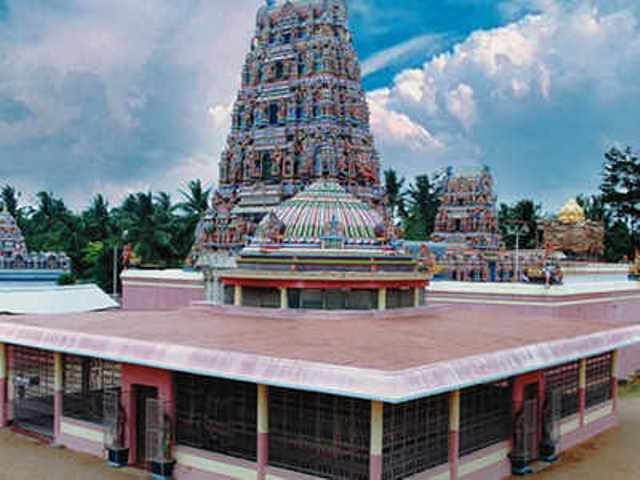 The Sri Raja Rajeshwari Temple was finally completed and dedicated in 1978. Today, more and more devotees and curious Western tourists come to see the temple. It is observed that on the 27th day of March each year, the sun directly falls on forehead of the Holy Mother’s image, creeping down to its feet as the sun slowly rises. People doubt if Sri Tiruchi Mahaswami intentionally constructed the image to create this effect on just one specific day of the year. The temple houses the New Sri Chakra shrine. Sri Raja Rajeshwari Temple comes to life every year during the Navarathri and Brahmotsavam Celebrations. Priests come to perform colorful rituals and recite the Vedas and the Saptashati. Navarathri is particularly very pompous and grandiose, characterized by an abundance of food that is offered for free to everyone who comes to worship and participate in the celebration. Meanwhile, the temple gets very crowded and at its busiest on Tuesdays, Fridays and Sundays, which are the special days of worship. Jayendra Puri Swami succeeded leadership of Sri Raja Rajeshwari Temple as Sri Tiruchi Mahaswami attained Mahasamadhi on January 14, 2005. The new guru is fluent in all the languages in South India, as well as in German and Italian.